(SitNews) This is one really big salmon", said Alaska Governor Frank H. Murkowski speaking at the unveiling ceremony Sunday of Alaska Airlines' newest aircraft, the "Salmon Thirty Salmon," a Boeing 737 painted in the likeness of an Alaska Wild Salmon. The "Salmon-Thirty-Salmon," sporting the glimmering image of a wild Alaska king salmon, is among the world's most intricately painted commercial airplanes. 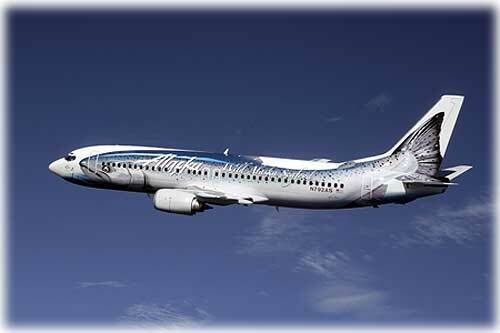 Complete with shiny scales, a dorsal fin and gills, the livery on the Alaska Airlines 737-400 passenger aircraft is the result of a dedicated team of 30 painters working nearly nonstop for 24 days. "Salmon-Thirty-Salmon," sporting the glimmering image of a wild Alaska king salmon. The airplane symbolizes the critical role Alaska Airlines plays in transporting fresh Alaska seafood to the continental United States and beyond. The aircraft features the most elaborate design ever painted on a commercial jet and its art came about from a unique partnership between Alaska Airlines, Alaska Fisheries Marketing Board and the Alaska Seafood Marketing Institute. In his remarks at the maintenance hanger at Ted Stevens International Airport in Anchorage, Gov. Murkowski said the aircraft serves as a fitting symbol to the state's important fisheries resource and Alaska Airlines' role in getting the resource to markets. "'Alaska Seafood' ranks second in name recognition throughout the United States, even higher than 'Hershey's' It is plain to see the branding of Alaska seafood pays big dividends," Murkowski said. "When it comes to getting Alaska's seafood to market, Alaska Airlines plays a role that can only be described as vital." "This is one really big salmon. One hundred and 19 feet long and 143,500 pounds to be exact," Murkowski said. "It will serve as a dramatic and instantly recognizable ambassador to promoting Wild Alaska Seafood, the State of Alaska and of course, the airline that bears Alaska's name." Seafood is an important driver of Alaska's export markets, accounting for $1.4 billion or 52 percent of the state's total export market. The U.S. has significantly increased its appetite for seafood, in particular salmon, as consumption of fresh and frozen salmon fillets have increased 15 percent annually, according to the Alaska Seafood Marketing Institute. ASMI's price-tracking program shows increased prices for all salmon species in 2005. This year, Alaska Airlines will fly more than 30 million pounds of seafood from Alaska to markets in the continental United States, Mexico and Canada. Streamlined flight schedules and state-of-the-art storage facilities allow much of that seafood to travel from Alaskan waters to market and restaurant destinations anywhere in the United States in less than 24 hours. 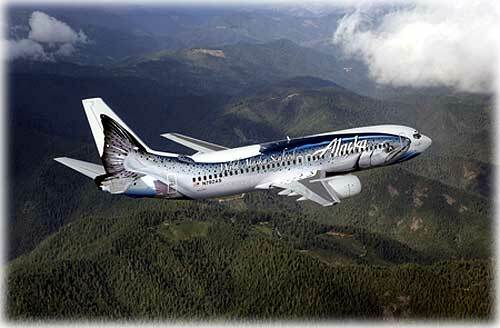 "Alaska Airlines has a long history of serving the Alaska seafood industry, and this special plane celebrates that commitment in dramatic fashion," said Bill Hines, AFMB's executive director. Hines noted that about half of the United States' total seafood catch comes from Alaska fisheries and that Alaska is considered the world's leader in sustainable management of its seafood resources. "At a time when the airline industry is facing unprecedented challenges, Alaska Airlines sees great opportunity in the expansion of its cargo operation," said Matt Yerbic, Alaska's managing director for cargo services. "The major investments Alaska Airlines is making in cargo will better position our company to serve the growing cargo needs of the state of Alaska, as well as other customers along our extensive route system in the United States, Canada and Mexico." This year the carrier finalized a $15 million contract to retrofit five of its 737-400 aircraft to cargo configurations, including one all-cargo airplane and four passenger-cargo "combis." The first converted cargo aircraft is scheduled to start service in spring 2006. The "Salmon-Thirty-Salmon" aircraft was greeted in Seattle by thousands of Alaska Airlines employees, guests and dignitaries during a salmon homecoming event at the airline's maintenance hangar. The aircraft will fly its first regularly scheduled passenger flight tomorrow from Seattle to Anchorage, Alaska, where it will receive a similar homecoming welcome. Following its stop in Anchorage, the aircraft continued its Sunday route with stops in Cordova, Yakutat and Juneau, Alaska. Beginning on Monday, the aircraft will fly passenger routes along the West Coast, connecting destinations as far north as Alaska and as far south as Mexico. The aircraft also will fly east to Denver, Chicago and Dallas/Fort Worth, becoming an important tool to promote wild Alaska seafood. The "Salmon-Thirty-Salmon" aircraft features an original design by Mark Boyle, a Seattle-based wildlife artist who is also a recognized leader in the livery design of commercial aircraft. The project required three times as many hours to paint as the normal livery, using Mylar paint to create an iridescent look and airbrushing techniques to make the fish painting appear three dimensional. The aircraft received its new livery at Goodrich Aviation Technical Services of Everett, Wash., with painting provided by Associated Painters and design managed by Teague Associates. The 737-400 aircraft has been in Alaska's fleet since 1997 and was originally scheduled to be re-painted with Alaska's traditional Eskimo livery. Alaska's fleet includes four other themed aircraft, two featuring the airline's alaskaair.com logo and two commemorating the carrier's partnership with Disneyland Resort®. Based in Anchorage, Alaska, the Alaska Fisheries Marketing Board is a private, non-profit organization created by Congress in 2003 to increase the marketability and value of Alaska seafood products. Alaska Airlines and sister carrier, Horizon Air, together serve 88 cities through an expansive network throughout Alaska, the Lower 48, Canada and Mexico. First Lady Nancy Murkowski flew on the "Salmon Thirty Salmon" from Seattle after attending a roll out ceremony at the SeaTac Airport where Alaska Airlines landed the world's largest king salmon-stretching nearly 120 feet and weighing in at more than 140,000 pounds-at Seattle-Tacoma International Airport Saturday. The Anchorage ceremony also included remarks from Alaska Airlines Chairman Bill Ayer and a special salmon homecoming dance by the Alaska Native Heritage Center Dancers.